Karur Vysya Bank has released its recent Recruitment for Chief Risk Officer (General Manager) Posts. Here we have updated complete information such as examinations and interview, eligibility criteria, Offline registration processes, payment of prescribed application fee/intimation charges, Karur Vysya Bank pattern of examination, Karur Vysya Bank Syllabus, Karur Vysya Bank Question Paper, Karur Vysya Bank Admit Date Release Date, Karur Vysya Bank Exam Date, Karur Vysya Bank Result Date . Find here more details below. 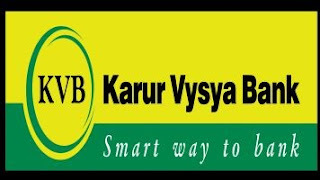 Karur Vysya Bank (Tamil) is an Indian private-sector bank, headquartered in Karur in Tamil Nadu. It was set up in 1916 by M. A. Venkatarama Chettiar and Athi Krishna Chettiar. The bank primarily operates in treasury, corporate/wholesale banking and retail banking segments. KVB provides services such as personal, corporate, agricultural banking and services to NRIs and MSME. Under personal banking, the bank provides housing loan, personal loan; insurance; and fixed deposits among others. Under corporate banking, KVB provides services like corporate loans; demat account, multicity current account and general insurance among others. Schemes provided by KVB under agricultural banking include Green Harvester, Green Trac and KVB Happy Kisan among others. Under MSME, the bank provides products such as KVB MSME Cash, KVB MSME Term Loan, KVB MSME Vendor Bill Discounting and KVB MSME Standby Term Loan among others. The bank had added more branches and 10 ATMs during the year thus bringing the total to 735 branches and 1,748 ATMs as on Mar 31, 2017. It introduced a number of initiatives in FY16 like reloadable cards, kisan credit cards, automatic passbook kiosk, e-book, etc. The latest being introduction of fast tag and UPI based payment system. Total business volume is 95,000 crore as on Mar 31, 2017. Age limit range: Age Limit Should be between 45 -55 Years. Candidates Relaxation in Upper Age limit will be provided as per Govt. Rules. Go through Karur Vysya Bank official Notification 2017. Salary details are: As per IBA Norms applicable to Respective cadre + other Benefits / allowances as per internal policies of the Bank. 3. Read the notification in full details.